I have recently had contact from the owners of the well. They have had considerable problems with gates being left open and livestock being endangered and have been forced to close off access to the well. We first visited Ffynnon Fair (St Mary’s Well) during the Easter holiday in 2011, since then we have made several visits, it remains one of the most evocative settings for a holy well in North Wales. Initially finding it was a challenge, mainly because we’d forgotten the map. After driving from St Asaph to Denbigh and back looking for signs we were forced to return to Denbigh and find a shop open enough to sell us an OS map on a bank holiday. That got us close enough, and after asking a lady in a cottage up the lane for directions we finally found the route. Down a track, through a gate across a field of cows (always wary of cows), where we paused to watch a herd of wild deer grazing before they jumped a barbed wire fence, and then across a very boggy stream we finally found the well site. It is set on the floor of a broad river valley flanked by steeply sloping woodland well below the level of the road. Beside the well are the remains of the ruined well chapel, encircled by an iron fence. In 2011 it was so totally overgrown that access to the buidlings was almost impossible. The current photographs were taken in February 2012, at this time much of the undergrowth had died back and the whole site appeared to have been cleared and was more accessible on that and on subsequent visits. The earliest part of the chapel building dates from the 13th Century. In the 15th Century a chancel was added to the south. The altar was then situated, unusually, below the southern window, traces of its base remain. The well basin beside the chapel is in the form of a star, similar to the more famous well at Holywell. For a long time this led to speculation that there were historic links between the two wells and that they were rebuilt at the same time. It was also thought that in the past ornate pillars supported a canopy over the well, similar to those at Holywell, however excavations in the 1960s concluded that it had never been roofed over. Although St Mary’s at Cefn regularly featured on the pilgrim path between Holywell and Gwytherin, there is no evidence that buildings at the two were linked, and it is now considered that all the archtetural similarities are due to nineteenth century embellishments rather than historical connections. 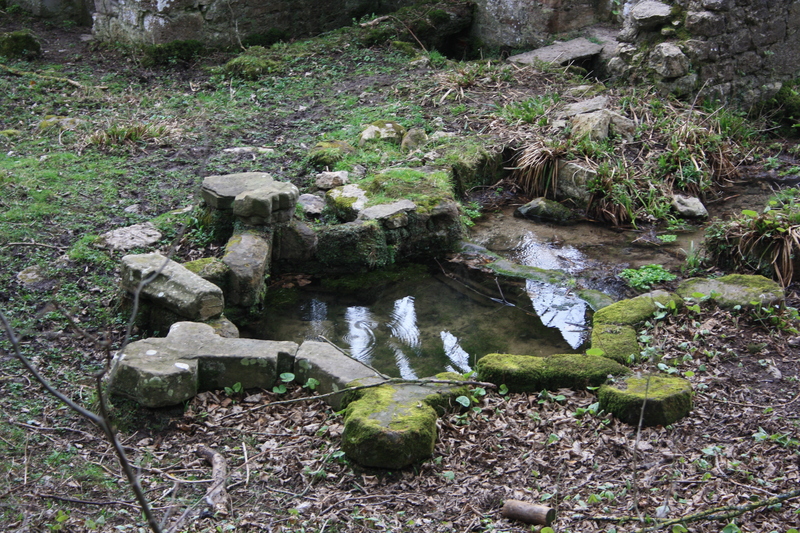 Following the Reformation the well began to fall into disrepair, although it remained in use by the landowning family. There are records dating from the early seventeenth century which make references to clandestine marriages being conducted there, most notably three sisters Catrin, Elizabeth and Marie Lloyd who celebrated their separate marriages here between 1615 and 1633. Clearly they were as taken by the remote charm of the chapel as people are today.. The site has been described as the Gretna Green of North Wales. It was finally ruined during the anti Catholic campaigns during the reign of James II toward the end of the seventeenth century. Gray Hulse  quotes Browne Willis’s 1720 account of St Asaph to demonstrate that even then Ffynnon Fair remained firmly on the pilgrimage trail, suggesting that pilgrims to St Winefride’s Well at Holywell seldom failed to also make a visit to this chapel, and that “by the side of the well there grows a sweet scented moss much esteemed by pilgrims”. There are few records of the healing properties of the well, although it has been claimed to have been resorted to for cures for rheumatism and arthritis. 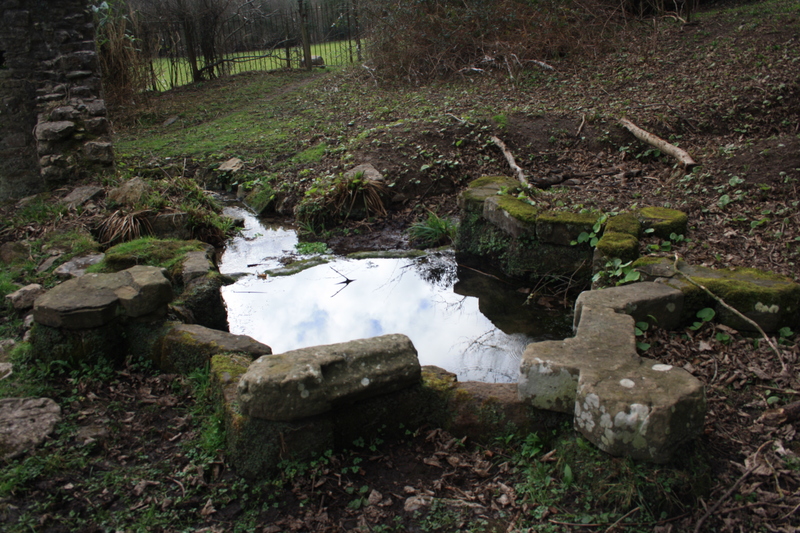 The small bath beside the spring has been explored during an excavation and it was concluded that it was added during the Victorian period, more as an architectural feature than for practical use. 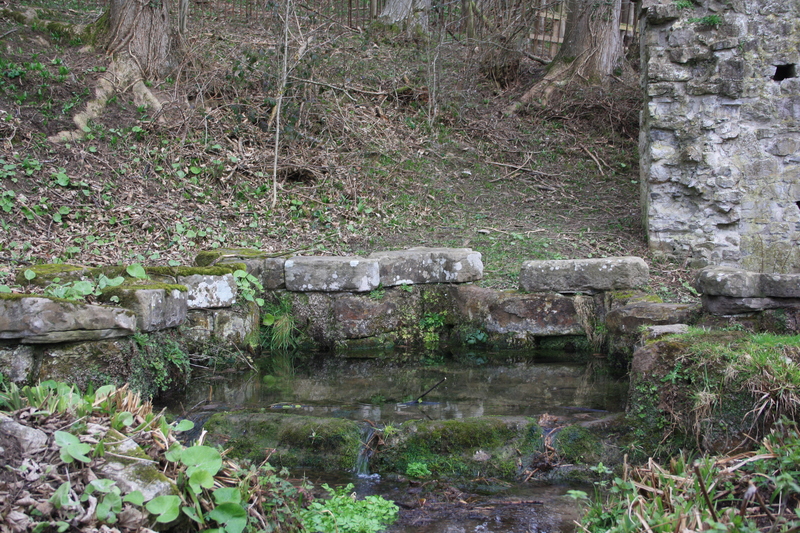 It is suggested that the changes carried out as part of a major reconstruction of the site during this time were intended to echo the design at St Winefride’s Well at Holywell by the then landowners who used the area as a landscaped walk and picnicing area. 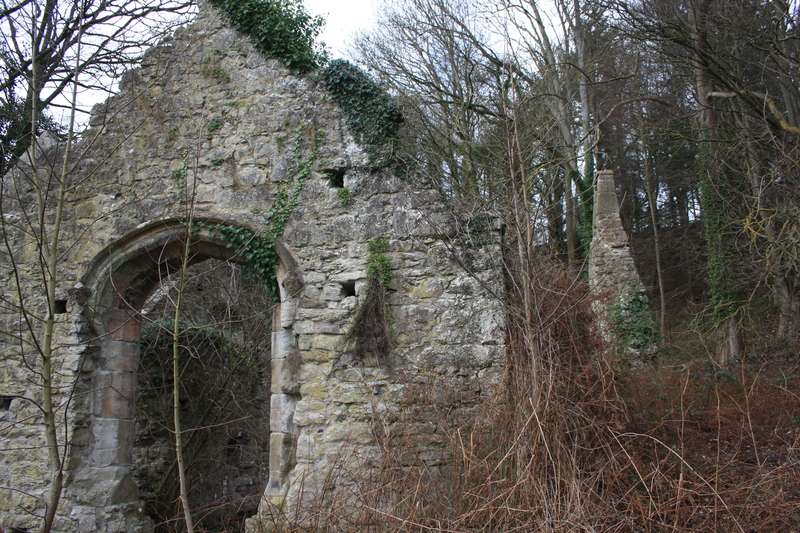 By the 18th Century the chapel was in ruins and the pilgrimages had declined. Lovers of the romantic and picturesque however continued to admire the remains. Poet Felicia Hemans (1793-1835), mainly known now for her poem Casabianca, spent her youth living close to St Asaph and would have visited the well around this time. She wrote her ode Our Lady’s Well in its honour, which can be read here. She produced a sketch of the well as it stood in her day, which is a prime source of evidence for the level of reconstruction the site underwent in the nineteenth century. Her drawing shows the west wall of the chapel as standing little more than a few feet high, suggesting that this has been rebuilt since then, and the little bell tower is thus a relatively recent addition. Also she does not show the star shaped well basin, again supporting the idea that this is an embellishment added much later, to mirror the well at Holywell. Another long term belief was that that the chapel had once been in a cruciform shape, with the well enclosed within the fourth arm. Recent excavations have disproved this idea too, showing that the spring itself was never enclosed within the chapel. 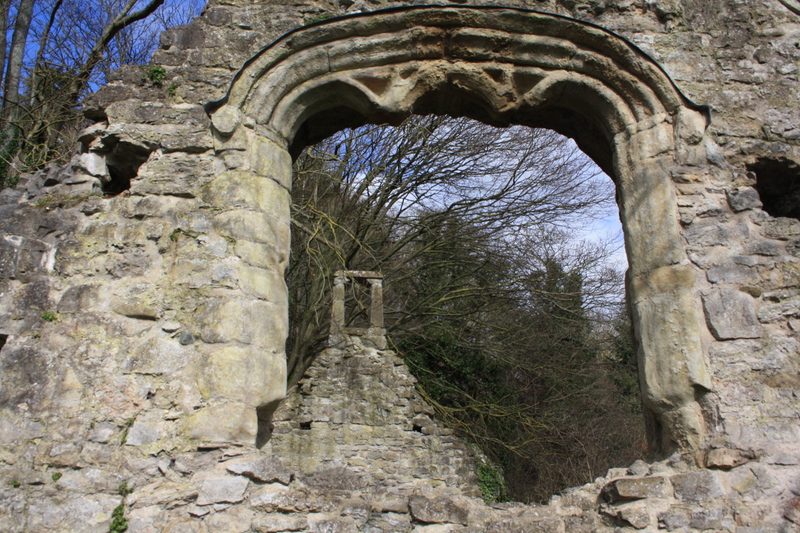 Although the water from the spring was always channelled into the building by the west door. There is a theory that the stream could be dammed when required within the chapel beside the west door to form a small internal bath, however there is no documentary evidence for this. The Elwy here takes another direction, running west, and then north, alomng most romantic dingles, varied with meadows, woods, and cavernous rocks: neither is it destitute of antiquities. 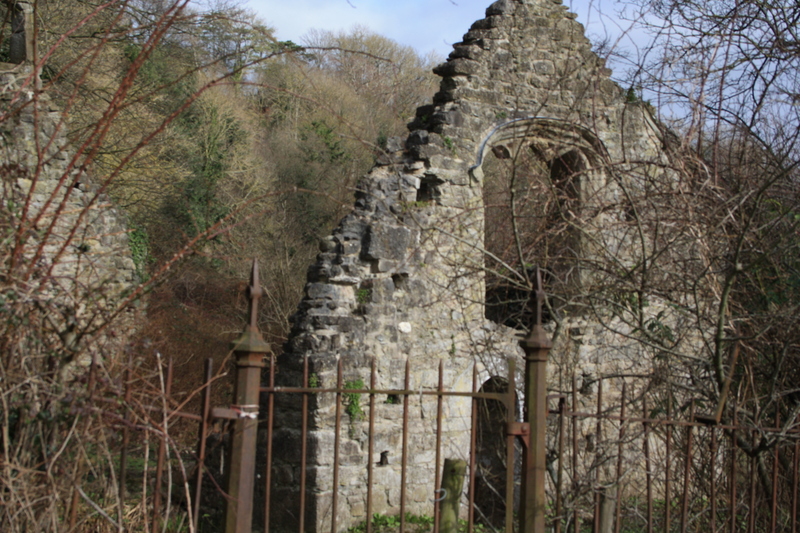 Y ffynnon fair, or our lady’s well, a fine spring, inclosed in an angular wall, formerly roofed; and the ruins of a cross-shaped chapel, finely over-grown with ivy, exhibit a venerable view, in a deep-wooded bottom, not remote from the bridge; and, in days of pilgrimage, the frequent haunt of devotees. 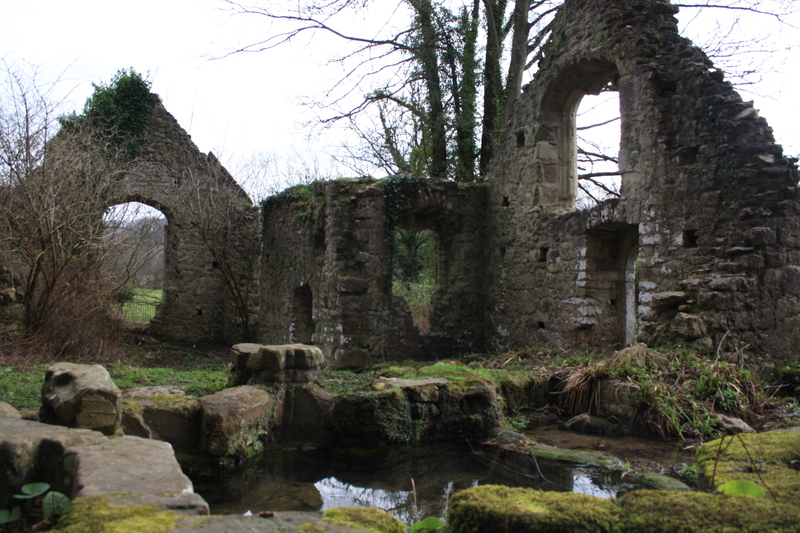 These descriptions hold true today, the well still discharges water which forms a stream running through the field to join the Elwy, deer are often seen nearby and the ruins, still covered with ivy, remain an evocative and peaceful location to visit at any time throughout the year. Gray Hulse, Tristan (2002) The Documentation of Ffynnon Ddeier. Living Spring. thank you for commenting, it may well have been you that pointed us in the right direction. It seems to be a lovely place to live, except I’m sure for the well hunters for ever getting lost. I am going to be in the area next week and would very much like to visit the site. Do you have the geo coordinates, or do you have a recommendation about how I can best find it? Many thanks. Visited today. After heavy rain the well was overflowing, and quite murky looking. I wasn’t tempted to have a drink! Beautiful place though, if a little hard to find. I walked past it and had walked a long way up into the woods before I realised. No I don’t think i would drink it either – I think bathing in it rather than drinking was the approved method, but it would need a nice day for that too. I was there again last week, it seems that someone has removed a few bars from the fence and the cattle have found their way in. The ground was very churned up – I don’t think I’ve ever seen it looking so muddy and messy. Hello Wellhopper, I am doing a site page for St Mary’s Well (Ffynnon Fair) for my website, however I don’t have a photo. Would it be okay to put one of yours on my site. Obviously I would credit you, add a link to your site, and give you a “thankyou”. Thanks. Oh thanks mate, sorry cannot remember your name – apart from Wellhopper – and did not know your email. But thanks. Will use one of these brilliant photos with a credit, link, etc. Any idea where I can find a copy of Felicia Hemans’ sketch? Many of the interpretations are so contradictory that it is difficult to date. The orientation does not conform with the usual plan of a chapel and the well basin interrupts both the N wall of the ‘chapel’ and the projected line of an E wall to a ‘lost’ N extension. I don’t actually know I’m afraid. I have thought a few times that I need to track it down. I have to admit though that in this case I am quoting information second hand having heard it from Tristan Gray Hulse who has made a detailed study of accounts of the site. Any contact details? I met him during conservation work at Ffynnon Beuno some years ago and have subsequently lost his address. A condition survey is to be undertaken at Ffynnon Fair. I to was refused access to st Mary’s well…I was brought up and lived in cefn meiriadog for many years and think it’s apauling that the farmer won’t allow you to go across the field to it …what about the right to roam? Surely this isn’t right . If it’s 800 years old then something should be done about it ..
Hi Barbara – thanks for your comments.